Finally our wish is granted. This cute little baby was finally back home here in the philippines. After 3 months finally she's here already. Were so happy she's here. But she can't understand tagalog or visayan language. We should speak japaneese so she can understand us. really! hehehe Nothing! really! I'm just happy. *ciao* Welcome home aimi chang. What happened, In the afternoon my mom called me up to fetch my sister after her tutorial class and they suggested to me while waiting them, we go first to the nearest mall then they'll fetch us. Then my sister and I decided to play at time zone. She has a allowance so, she bought time zone card. After playing there's money left on her card. We decided to take a picture with van gogh. We go inside and have a sit and follow the instruction there. We choosen charcole picture. We just sat and choosed what frame we like and eyes on cam then that's it. We already have a picture draw by charcoal. heheheh nothing! just want to share it. Yesterday, I visited my doctor for regular check up every month. After that i decided to pass by to the mall and play at arcade game. You'll see on the picture? I've won lots of token. really!! Guys, do you have a belief in lucky color of the day? Or a colors that could be wear everyday? Before i don't believe that. But when i started to try what color to wear, it change. I know it's a crazy thing and i don't think if you've gona believe me but it happen. First, last saturday i've wear black t-shirt because it's the lucky color on that day. 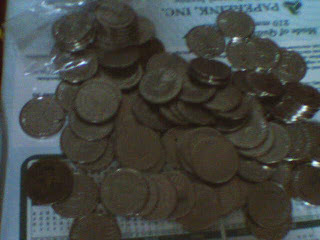 Then my sister and i played at the arcade game and yet i've lots of token too. Then as what i've told you, I played yesterday and i've also won tokens, is this just a coincidence? or it's my lucky day? I played many times but i didn't won lots of tokens. I will share to you what colors that could be wear everyday. It's up to you guys if you believe or not and if you'll try or not. Just try it guys, there's no harm on trying. And tell me about this guys. Is it true or not? Or i'm just crazy enough for believing of that lucky colors. I keep on thinking what happened to the entrecard? you guys? can you drop ec cards? When i try to log on in entrecard this message appeared. Outage for a maximum of 2 hours until 7AM Boston time while we try and deal more conclusively to performance issues we are experiencing during high-load times. We apologize once again and hope this outage will be the last we need for some time. You guys, you experienced the same thing? What happened, yesterday afternoon i did 220 drops in others blogs 80 drops more to make it 300. I decided to finish it in the evening before i sleep. I've turn off my laptop and rested. In the evening after dinner time, i've washed my face then i turn on the laptop to finish my work dropping. But unexpected situation happened. I can log-on into my ec account but when i started to drop it will hanged my laptop the server is very low. I've tried to log-on into other sites but its okey. I can easily log- on to others site. Once again i've tried to drop, still the server is low. Then after several minutes. The server that does the complicated work has not responded in time, this could be due to load, due to an upgrade happening, or something else even weirder. An alert should have been triggered to the admins so they're no doubt trying to deal with it right now, we recommend trying again in 10 minutes. I'm sad! I keep on trying after a 10 minutes but same message appeared. I'm really sorry guys if i've missed dropping your blogs. I just make it up to you guys if entrecard will back to normal. What i did, my sister has a home work in science. She ask me a favor to search in the internet about human body and digestive system. Then i helped her. After doing my task she did her part. My sister should draw the heart and label it. Just want to write here that our heart beats over 100,000 times each day. Our heart pumps blood through our body. Our heart beats more slowly when we sit still, and it beats faster when we do exercise. So we should take good care of our heart. We should exercise everyday and eat healthy foods to keep our heart healthy. On this day, I was awake around 2pm already. I take my meal then after I’ve rest for awhile at the same time watching TV. When I fully rest I’ve sit on my couch. First thing I did, I checked my e-mail, my payperpost and smorty account if I have a assignment to do. Then after checking i already do my job by dropping and reading some post of others blog. And now, for the very first time i did it. Yes! i did 300 drops on this day in my entrecard. In 2 weeks of trying hard at last i did. And i'll maintain 300 drops per day. I know it's not a big deal but i just want to share it to you guys. Nothing more, nothing less. What happened, when i wake up its already 1pm and i take my two meal, my breakfast and lunch. After that i scan first my laptop if there's a virus, it's my daily task before using the internet. When i'm done. 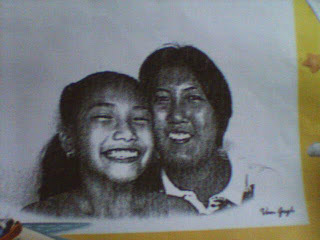 First thing i did, i've check my e-mail, i've receive an mesaage from tita joy the mother of cute baby the one who's in the picture above. I've read the message i thought it was good news but it's not. 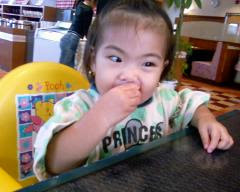 Our cute baby aimi was sick. She has cough, fever and colds she suffered almost 1 week already. Were worried about her. Then we suggest what if she'll entrust aimi to us. We'll take care of her like we did before, but tita joy replied they're okey there and nothing to worry about. My last message to tita joy was. What ever will happened, if she can't take the problem anymore don't hesitate to call us and she should take care of her self always and be strong enough for whatever trials may acrossed in her way. We just hoping that she'll gona change her mind and she'll entrust aimi to us again. 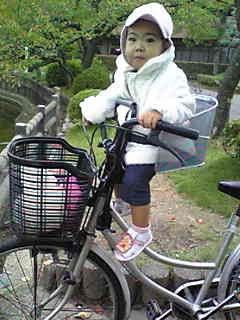 And i hope baby aimi is okey now. 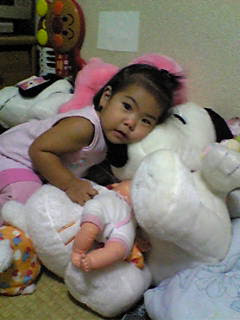 Get well soon baby aimi. We really missed you so much if you only knew. What happened and what we did, i almost forgot to share to you guys that yesterday we've celebrate our fiesta here in our village. Our patron is St. Therese. What we did, We don't prepare any foods in our house, we've just attend the holy mass then my mother donated a we called "letchon baboy" for our chapel, to let anyone can eat, and the other officers in our patron donated also. I just remembered that last year fest my mom slipped at the gym. Many recognize her and she hastily to got home. She's ashamed of what happened. Then we got home, we keep on laughing at her. heheheh And she said, that’s the most embarrassing moment of her life. 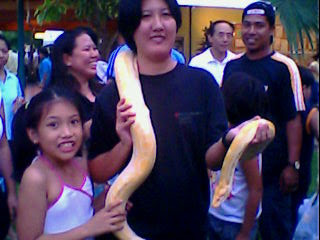 That is was our first time adventure at crocodile park. I can't believe we can go there because at first my step father did not agree to have adventure at park for the reason it's expensive and by that time he forgot to bring extra money. But my sister really want to go inside. There's nothing we can do but to pay the entrance fee and have fun. When we get inside first stop we went to the snake i forgot the name of the snake then we watched the tigers named shiva the female and datu the male tiger. 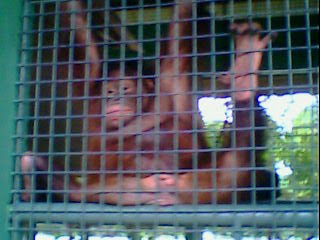 After that we went to carlo the orangutan. His friendly but don't tease him. After that, we went out to have some dinner. Then after we went home. 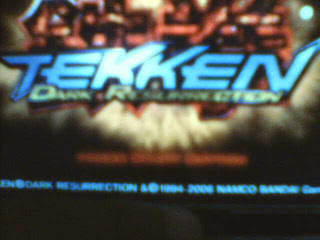 If my sister using the laptop, what i did is, ill ask a permission to borrow her psp and tekken dark resurrection is one of my favorite game.. I play the character of Hwoarang. And i finished his story battle and my rank at arcade battle is 202 wins, 8 loses, and 96.19%. hehehe NOTHING! Just want to write it on my blog. Nothing more, nothing less..
2. Post the rules on your blog (this is what you are now reading). 4. Tag 6 people at the end of your post and link to them (this is only a game). I am 25 years old, a commerce graduate major in business managment. I used to take a computer programming but my mom don't want that course so i take management. Before ive been working as a attendant / cashier at internet cafe, now presently im working as a Key Account Specialist or a Telemarketing and were selling credit cards. We do calls or going place to place to sell our products. Im avid fan of naruto. really... (mabuang nko pangita ug cd na tagalog, mas lingaw man gud.) db? Im friendly person and easy to be with, im not kind of person who'll pretend to be somebody just to gain love and acceptance to others. Now i love blogging hehehe thats all! bow..